Drawing for Nature journal cover. 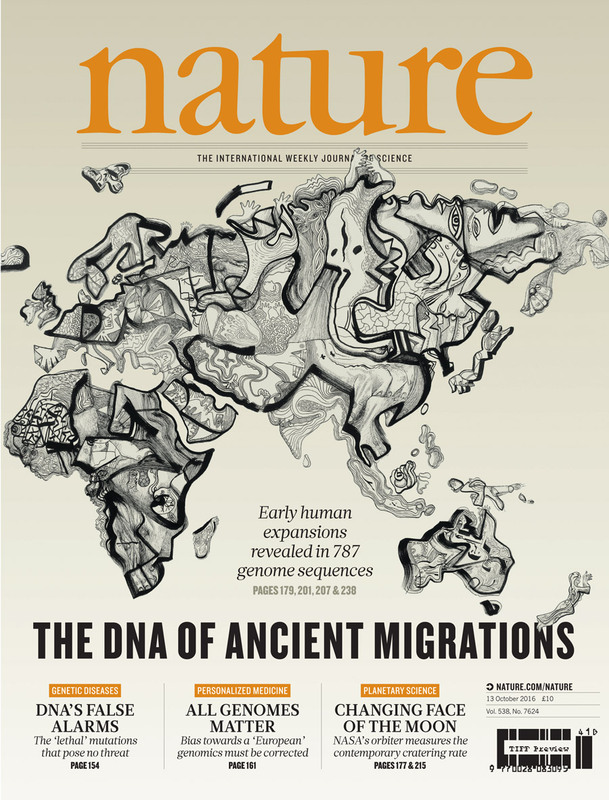 Three international collaborations reporting in this issue of Nature describe 787 high-quality genomes from individuals from geographically diverse populations. David Reich and colleagues analysed whole-genome sequences of 300 individuals from 142 populations. 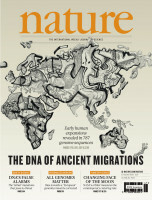 Their findings include an accelerated estimated rate of accumulation of mutations in non-Africans compared to Africans since divergence, and that indigenous Australians, New Guineans and Andamanese do not derive substantial ancestry from an early dispersal of modern humans but from the same source as that of other non-Africans. Eske Willerlsev and colleagues obtained whole-genome data for 83 Aboriginal Australians and 25 Papuans from the New Guinea Highlands. They estimate that Aboriginal Australians and Papuans diverged from Eurasian populations 51,000–72,000 years ago, following a single out-of-Africa dispersal. Luca Pagani et al. report on a dataset of 483 high-coverage human genomes from 148 populations worldwide, including 379 new genomes from 125 populations. Their analyses support the model by which all non-African populations derive most of their genetic ancestry from a single recent migration out of Africa, although a Papuan contribution suggests a trace of an earlier human expansion. Cover art: ‘A genetic improvisation on a world map’ by Markus Kasemaa.